It’s noticeably busier in Granada this week. The streets will progressively fill over the coming months until August, when the heat gets too much and people head out to cooler places. It’s already mighty hot; Spain’s first proper heat of the year has swept across Andalucía. Weather maps have turned from orange to red, and now the colour of dried blood. Shopworkers teeter on stools enjoying their morning break in cafes – perhaps a cortado and jamon bocadillo – while sweating tourists gather in groups near the cathedral, on Plaza Bib Rambla – once the site for trading slaves centuries ago – awaiting instructions about the day’s first excursion. After a zumo de naranja and dark chocolate eclair (barely larger than one’s thumb but delicious all the same) we saunter to the lower section of El Albaicin, in particular, the old Muslim quarter of Axares. The narrow alleyways, with cobbles underfoot made slippy by dripping water, make it hard to negotiate at times. On an old facade – crumbling and chalk white with sprigs of swifts’ nests – the morning sun fires spotlights over our heads to wither weeds that sprout between cracks. A glance to the right and a glimpse of the Rio Darro at Paseo de los tristes – the ‘Avenue of the Sorrowful’ where funeral processions once made their way to the cemetery; to the left, a steep climb to the bountiful cármenes of El Albaicin and one of the world’s best views, the Alhambra. In mid-June there are still traces of snow on the Sierra Nevada; the vast, hazy backdrop to the city’s jewel. Talk about fire and ice. People here adore their city and cater for the hordes who visit. Hotel entrances jump out of nowhere, some with huge chestnut doors with studs of iron, their receptions dripping in geraniums and palms. Many have fountains with brass taps filling marble troughs. The hills of Granada are alive with the sound of water. An agitated cleaning lady talks to the Policía Local and someone yells from an apartment doorway next to a building perhaps closed for good – a graffitied time capsule of Granada’s past – or waiting, before shutters up, to burst into life at midnight. New streets are discovered and we fall in love, once again, with this fabulous city. 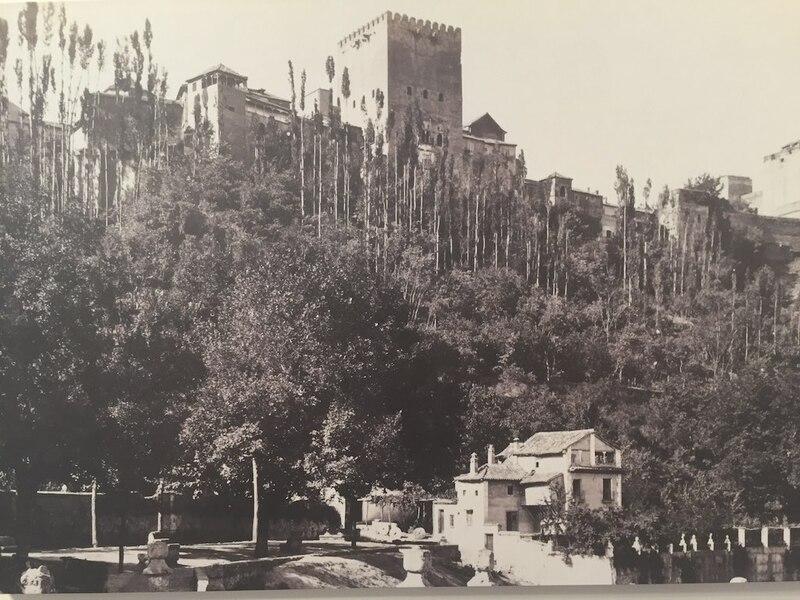 But we do have a goal: to track down a photographic exhibition showing Granada’s past. 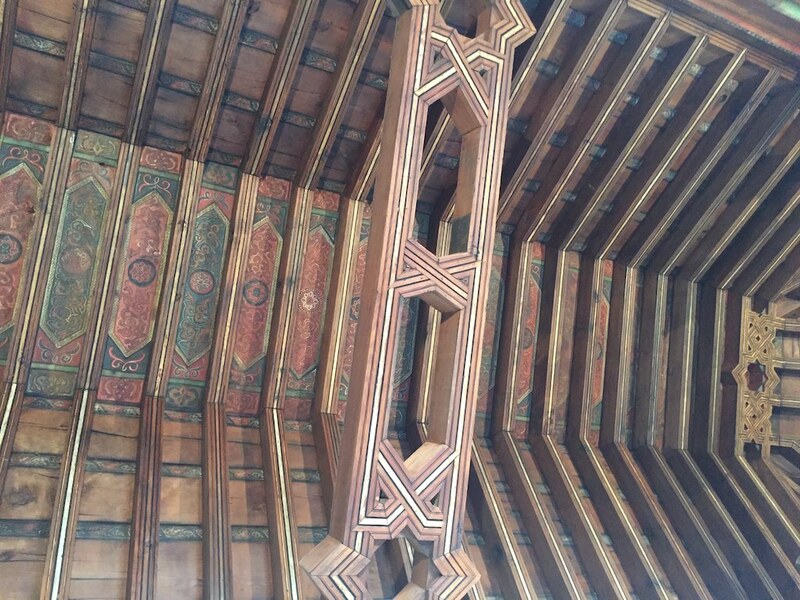 It’s housed in the Casa Arabe Horno de Oro, the Nazarite palatial house built in the late 15th century and later expanded after the Christian conquest (more on this place another day, but see the stunning wooden ceiling below). 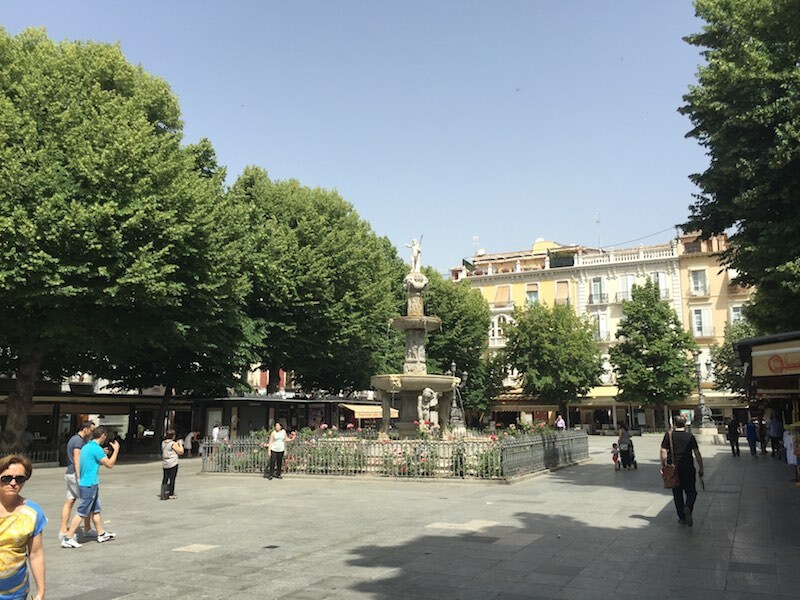 The image below shows Plaza Nueva: the Royal Chancery on the left, the church of Santa Ana (1537) centre and the Alhambra’s Torre de la Vela high up to the right. 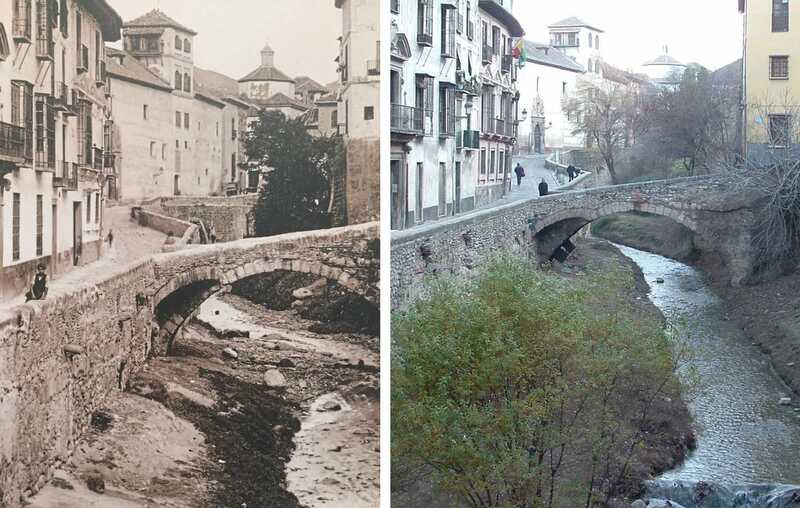 Like the image of the Río Darro above, apart from today’s shops and restaurants, it’s changed little. The English painter, John Frederick Lewis, spent time in Granada during 1833-34. 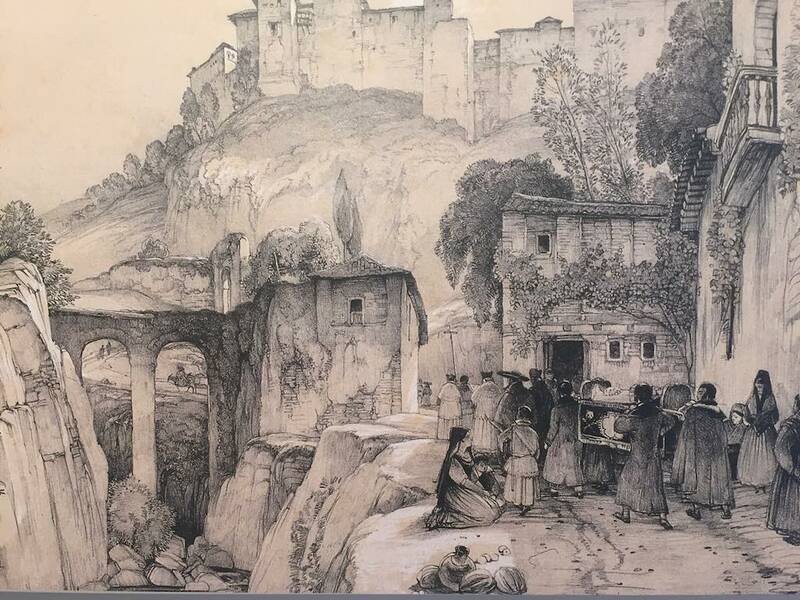 This lithograph shows a funeral procession. Its exact location is hard to pinpoint due to changes to the city, but shows the Alhambra in the background. More about him here. Again, a little-changed view looking up at the Alhambra. We think the tall trees, like flag poles, have gone. An amazing shot from 1875. Most visitors to Granada don’t get to see one of its main rivers – the Genil – but instead a tributary of it, the Darro. This is mainly because the Darro shows off its charms around the tourist area of Plaza Nueva, so millions each year stroll along its bank. 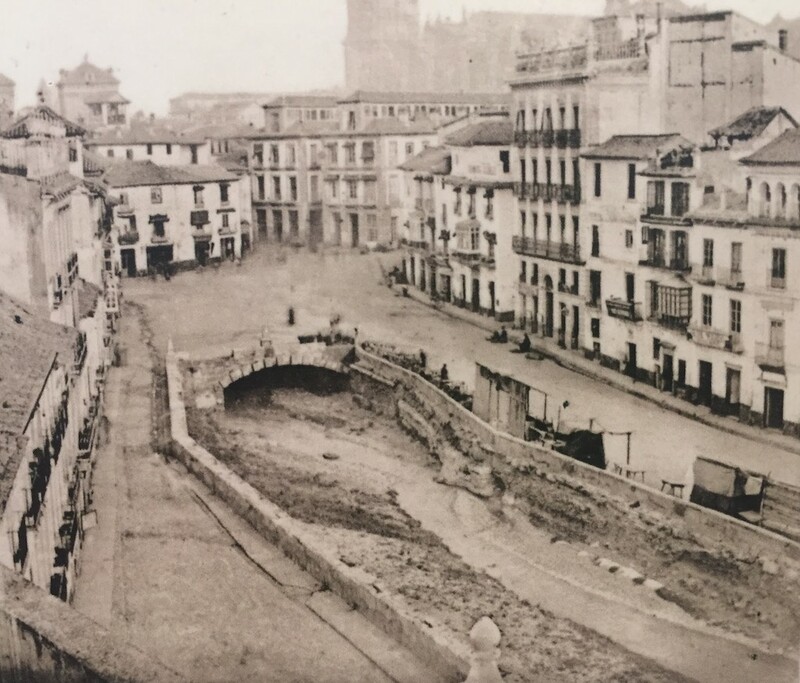 In centuries past, the river was more visible but was (partly) covered to enable the city’s streets to develop above (and rid the area of honky odours) – including Plaza Nueva in the mid-19th century. 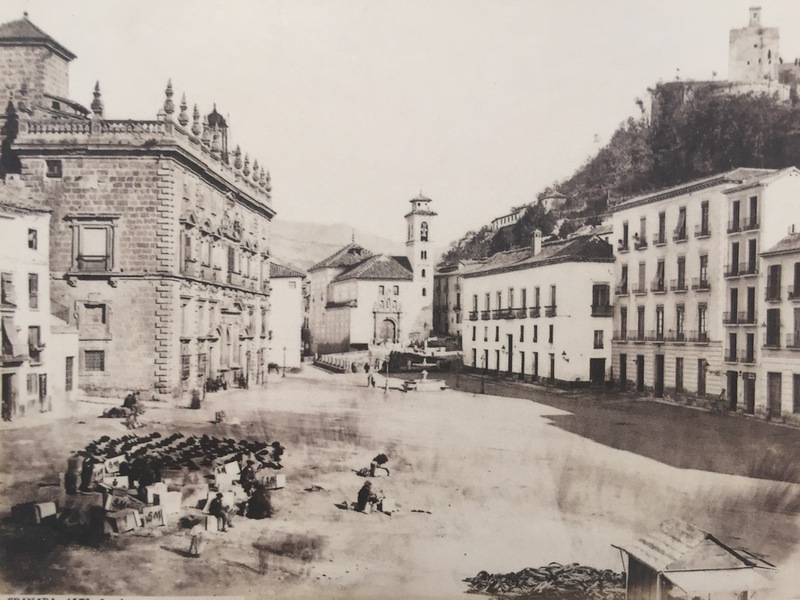 The image below shows what is now Calle Acera del Darro. If you’ve been to Granada then maybe ‘Burger King’ may help set the location. The cathedral looms in the distance. Location of Casa Arabe Horno de Oro, Calle del Horno, 14 Albaicín Google map (opens in new window).